While cinemas were screening 'The Perfect Storm', a true story of survival amidst massive waves in the west Atlantic Ocean, winter storms brought damage to the east coast of the North Island, threatening properties, and eroding beaches. The threat from the sea comes in two forms: sudden inundations and slow coastal erosion. Living by the sea has its risks. Are we sufficiently prepared? Do we sufficiently understand what is happening? In this chapter we'll explore why storms can become so powerful and why waves can reach far inland. Waves and wind. Those who work with the sea, our fishermen, navy and merchant navy, know from experience the whimsical force of the sea. They respect it, in order to survive. But landlubbers, particularly those living very close to the margin of the sea, appear to live in ignorance. The power of the sea comes from the waves, whipped up by winds. They appear whimsical because their destructive power increases with the fourth power of wind speed, as shown in the diagram. The waves' power spectrum, the coloured bell-shaped area, increases unexpectedly. The sea created by a 40 knot wind (red) is 2x2x2x2=16 times more destructive than the one arising from a 20 knot wind (green). But fortunately, it takes time for a sea to develop fully to this condition; some 24 hours in fact. Because of the Earth's rotation, winds move in circular patterns rather than straight lines, and after a while, as the weather system moves on, they cancel each other out. But once in a while, they don't. The perfect storm. In our climate area, winds very rarely blow in one direction for several days in succession. But when they do, massive waves can result. Such was the case in the west Atlantic Ocean, where in the fall of 1991, hurricane-sized waves were created by sub-hurricane winds. It demonstrated that direction, duration and fetch (distance) are as important as the strength of the wind. Places on Earth where the wind blows mostly in one direction are the 'screaming fifties', just south of New Zealand. One particular area, southwest of Africa, has an average wave height of over ten metres! The big one. Hurricanes or tropical cyclones as they are called here, are accompanied by very strong winds, depending on barometric pressure. The lower their barometric pressure, the higher their winds. The Saffir-Simpson scale shown here, classifies the strength of a hurricane in five classes, each next class being twice as destructive as the previous. As winds rush into the cyclone's centre, they push the sea level up, causing a storm surge as quantified with the red band in the diagram. Such storm surges would do no harm to steep rocky shores but flat beaches and harbours could be swamped by 2-3m of water above normal levels. Sandy beaches would offer little resistance to large waves riding on the higher sea level, resulting in severe coastal erosion. Coastal settlements would be damaged accordingly. When a storm surge is pushed into a narrowing bay, such as the Firth of Thames, it can reach much higher levels still. When people buy coastal property, they are unaware of such risks, but would people want to know? Surely some properties would lose their value! Tropical cyclones hitting New Zealand have barely tipped into class 1, arriving with 970 mbar centres. But it is not unlikely, particularly now that the world's climate is changing, that we will be visited by a class 3 hurricane. Depending on its path and the direction of its winds, our coastal settlements may suffer enormous damage. Those of us who venture into the sea water regularly, swimmers and divers, know the strength of the water from personal experience. But little do people realise that water is 800 times heavier than air. So when it moves, it produces proportionally stronger forces, forces that break large structures and that erode shores. Beach erosion. As the fast runabout planed its way along Byron Bay, we were surveying the coastal erosion wreaked upon it by a recent storm (May 2000). It had made headlines in the paper because the economies of the Sunshine and Gold Coasts of Australia depend on their beaches. "I don't know what they're on about", said Bill Sylvester, "the sea takes away and then puts it all back again. It has been like this for the past 45 years." Bill was right as so many observers have known for centuries, perhaps millennia. As the diagram shows, beaches sacrifice sand from the dunes to make a new and higher beach to resist the storm. At the same time, the large waves draw more sand towards the beach from further away. After the storm, the combined forces of the sun (drying the sand) and the wind, harvest sand from the receding tide and rebuild the damage done. But Bill hasn't noticed that many beaches all over the world have stopped doing so. They have become sick. The sand won't dry any more, or it forms hard crusts that can no longer be blown by the wind. People build hotels, houses and shelterbelts that lift the sea wind from the beach, so the sand won't be transported any longer. To make matters worse, although the contributing factors may increase slowly, a beach can become sick very rapidly. As a result, permanent erosion sets in and coastal property owners see the sea coming closer with every storm. Then engineering solutions are put in place: revetments (retaining walls), riprap (loosely strewn boulders), sea walls. But these do not work like a beach. They are steeper and harder and do not dampen oncoming waves, reflecting them instead. The bounced waves combine with the oncoming ones, resulting in a sea with twice the wave height, scouring the sand twice as deep. As a result, the beach disappears completely, as Noosa has found out. Engineers then pump sand from harbours and navigation channels onto the beach but the beach keeps disappearing. Surfers Paradise now has permanent pumping stations and pipes in place to maintain its beach. Once the sea meets a steep (natural or unnatural) wall, the beach disappears. 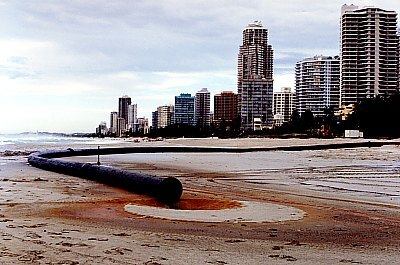 The photograph shows a beach renourishment pipe at Surfers Paradise in Australia (May 2000). Notice the narrow beach in the distance. Sadly, though, scientists and engineers have been relying on computer models to explain the transport of sand in the water as the major cause of beach erosion. But these flawed models do not mimic the rising and falling of the tides, the drying of the sand, the blowing of the wind and the undulating of the dunes, precisely the most critical processes affecting the health of a beach. If society is not prepared to tackle the true causes of beach disease: muddy seas, dense plankton and nutrient levels, coastal buildings, shelter belts and dune stabilisation, beach erosion will be here to stay, while getting worse. disappearing beaches: understand why beaches all over the world are disappearing and what people do wrong. storm classification and hurricane classes.